GSI Commerce (GSI) is the UK's leading provider of distance shopping solutions selling across multiple channels including catalogue and internet. GSI uses Priam software to drive their e-commerce, call centre and fulfilment operations. The Priam system integrates all aspects of database marketing, e-commerce, call centre, customer relationship management, warehousing, distribution and accounting into one unified business system. One of GSI's clients benefiting from the Priam system is the Early Learning Centre. Early Learning Centre opened its first store in the mid 1970's; today, with 213 stores in the UK and 78 international stores in 13 countries, it is a major force in pre-school toy retailing. Early Learning Centre recognises the importance of being a truly multi-channel retailer with customer service at the core of that offer, and have created a forward thinking and fully integrated infrastructure to support growth. Early Learning Centre has a successful direct shopping business including the website www.elc.co.uk, a dedicated B2B site for nurseries www.elc.co.uk/nurseries, two catalogues a year supported by a dedicated call centre service and a Big Birthday Club, all backed up by a highly efficient warehousing and fulfilment operation run by GSI. 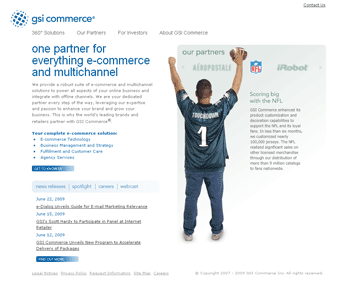 GSI is now part of eBay Enterprise. GSI chose the Priam fulfilment and e-commerce platform because of the flexibility and the broad range of functionality supplied in the standard package. "There's no such thing as a typical fulfilment client. What impressed us about the Priam system was the way the basic features had been easily extended to meet the specific needs of multiple industries, and the ease with which we can further adapt it in the future rather than treating our clients as 'one size fits all'." John Garrick, CTO, GSI Commerce. Early Learning Centre provide an exceptional level of customer service, for example, offering home delivery from within store, a no quibble returns policy to store as well as to the warehouse, telephone and e-mail enquiries to support direct orders and any other aspect of the business. Tracey Travis, GSI Client Services Director says, "The flexibility and ease of integration with the Priam system allows GSI to deliver exceptional service to Early Learning Centre customers, which wouldn't be possible with many other systems." As well as being highly functional, the Priam system also needs to be robust and scalable. Early Learning Centre have a huge Christmas peak. John Garrick, CTO for GSI comments, "Retail is a fast-moving environment. In terms of Early Learning Centre, not only do we need to be flexible enough to accommodate change, but at the same time we have to treble the size of the operation each Christmas. We need our processes to be efficient, easily trained, and adaptable according to the time of year. The Priam software solution coupled with GSI's services provides exactly what we need." Glyn Carvill, Commercial Director for Priam says, "We have a powerful partnership ethos with all of our fulfilment house clients and an excellent relationship with GSI. The combination of GSI's expertise within the distance shopping and fulfilment and the power and flexibility of the Priam business system offer a winning combination in the fulfilment house market place." GSI, the multi-channel retail expert, has improved its call centre customer service capabilities with the implementation of new front-end contact management software. GSI have introduced Priam's CRM Sales Manager integrated with a 'knowledge database' to the call centre. The combined solution will be used to provide a more extensive and efficient customer service for a number of GSI's clients who offer transactional websites and/or catalogues, one of the first being Early Learning Centre (ELC). The new contact management system is easy to navigate and user-friendly for the call centre team, enabling proficient resolution of queries. The majority of queries experienced by the call centre can be resolved first time as operators follow the system's response function to find a 'resolution path' appropriate to the query. The new system also provides GSI's clients with the opportunity to capture more detailed information about customers than previously possible. This allows customer information to be analysed in detail, enabling retailers to understand their business better. By collating product, in-store, website or delivery feedback, for example, retailers can identify opportunities to tailor the services offered to their customers. Up-to-date stock information is also now available through the system as it can be linked directly with the client's head office systems. This enables the call centre team to easily identify stock locations and help customers make reservations for store pick-ups. The 'Knowledge Tree' database enables the retailer to feed the call centre with regular updates and information, for example, new stock lists, promotions or processes, in order to support the customer service team. The Knowledge Tree also allows call centre operators to search for answers to any given enquiry, such as product assembly, on the comprehensive database of information, improving the quality of query handling. In implementing this new contact management solution, GSI are able to offer clients higher levels of customer service supported by a more empowered call centre team.